I'm trying to compose myself and talk about Chris Pine's tuxedo without gushing about his insanely handsome face and excellent beard and sparkling eyes. Okay. So, this Ermenegildo Zegna tuxedo is phenomenal for a few reasons. Single-button jackets are young and rakish and fun, and his fits like every guy wishes every suit fit them, ever. From the wide lapels to the fit of his slim trousers, everything about this is perfect. And causing me to swoon—it can't be helped. I love Matthew McConaughey's bold choice to wear this green velvet Dolce & Gabbana jacket. With black trousers and a black waistcoat it just works. Speaking of velvet, Chris Hemsworth wore a remarkably similar look to McConaughey, but with a charcoal gray suit and midnight blue velvet jacket. How effing happy and handsome does he look embracing his lovely and pregnant wife Elsa Pataky? And, speaking of handsome and happy—Matt Damon, the Golden Globes' resident garbage man. This classic peak lapel two-button tux and perfectly proportioned bow tie are just divine on him; a flawless look from head to toe. 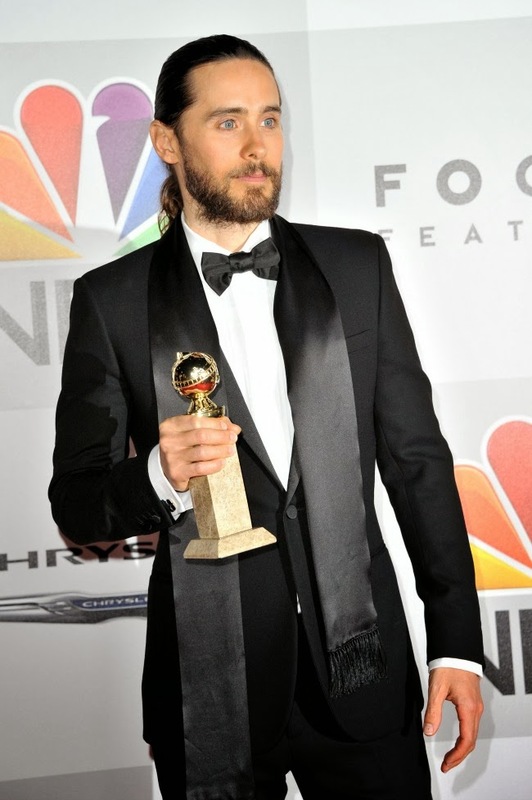 Last but not least, Jared Leto. Not many guys wear these formal scarves anymore, and I think it's kind of a brilliant way to contrast his rock-and-roll vibe—especially that killer man bun. For even more of my thoughts on the night's best (and worst) tuxedos, head over to Lifestyle Mirror.